ACE-SPONSORED RESEARCH: Can the LeanScreen App Accurately Assess Percent Body Fat and Waist-to-Hip Ratio? We’ve all had those days—and seen clients have those days—when simply making it to the gym feels like a struggle. The weights feel a little bit heavier, the other class participants seem to be moving double-time as you grapevine at half-speed, and the tension on the elliptical or exercise bike seems a bit more, well, tense. But what happens when those days become weeks, months or even years? 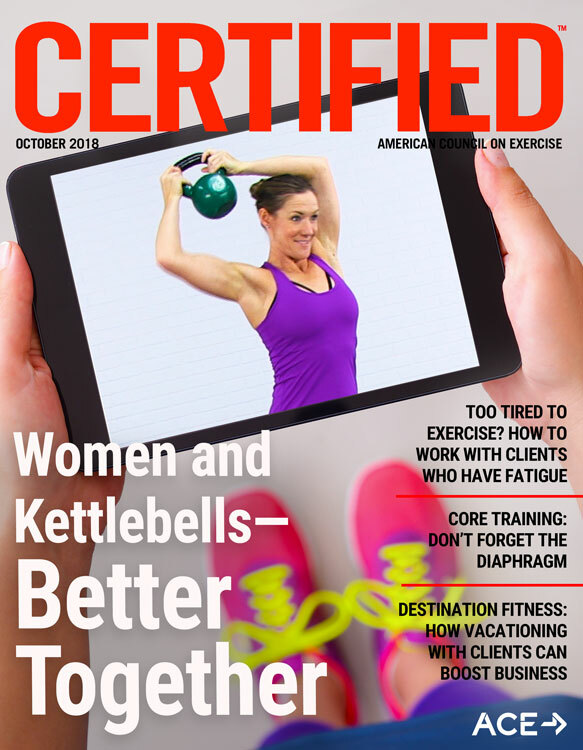 Group fitness instructors, personal trainers and, especially, health coaches will likely have clients or participants who battle acute or ongoing fatigue from a variety of sources. Read on to learn about how to modify an individual session when a client arrives feeling less than 100%, as well as how to improve long-term adherence among a group of clients who may have a number of reasons to consider just giving up and throwing in the towel. One in five American adults say fatigue interferes with their everyday life (Thames et al., 2012). Whether acute (short-term) or chronic (long-term), fatigue comes in many forms and from many sources: chronic disease (including fibromyalgia, diabetes, heart disease and systemic exertional intolerance disease), illness (including something as common as the flu or an infection), lingering injury, obesity or overweight, childbirth, menstrual issues, perimenopause and menopause, or simply aging. That said, the most common cause cited by the professionals I spoke with was life itself, and the stress that comes with it. Yes, everyone is overtired and overworked, but it’s important to avoid downplaying or overlooking serious medical issues. Few things could be more damaging to rapport than seeming to dismiss the legitimate medical concerns of your clients. That said, this article is not meant to address the actual causes of a client’s fatigue, but to offer tips for how to react in the moment when a client reports being too tired or overwhelmed to work out, as well as strategies for motivating clients affected by fatigue over the long haul. What is the appropriate response when a client arrives for a session and tells you that he or she is just too tired to exercise or focus on other behavior-change goals? First, congratulate your client for showing up, as that alone demonstrates a level of commitment to be proud of. It’s essential that health coaches and exercise professionals create an environment that is free from judgment, and that clients know it’s perfectly okay to share their feelings and that you are able to modify a workout or change the focus of a session based on how they feel in the moment. Graham suggests starting each session by asking clients to rate their energy level on a scale of 1 to 10. “This provides a quick glimpse of their current state,” she says. Their response may be affected by physical, psychological or emotional factors, and this simple ice-breaker establishes a safe atmosphere for a coaching dialogue. Based on a client’s response, you can use your coaching skills to explore what is making the client feel the way he or she is feeling, whether positive or negative. If a client reports being exhausted, Myers might start a session with some stretching or breathing exercises and use that time to “do some coaching” to help the client get to the root cause. “We may also do a mindfulness exercise or use visualization,” she says. Graham uses a similar approach: “I sometimes begin a session with a short, brisk walk outside so that we can discuss the potential reasons for the fatigue, while also drawing the benefits of simply moving and being outside.” With certain long-time clients, that walk may extend to the full hour if the conversation is fruitful and the client is O.K. with it. Graham does warn against using this strategy with newer clients who might question the effectiveness of paying a coach for an hour-long walk. Of course, other strategies for reducing the intensity of a workout apply as well, including lowering the resistance, reducing the number of sets or repetitions, increasing the duration of rest periods and decreasing the complexity of the exercises performed. Graham emphasizes this last strategy, saying that clients sometimes need a mental break, so simplifying the workout can be a welcome approach. Graham offers one final suggestion for working with clients battling acute or ongoing fatigue. She uses mindfulness strategies, including relaxation, meditation, visualization and diaphragmatic breathing, to stimulate the parasympathetic nervous system. This can serve to counter the constant stress most people experience due to overstimulation of the sympathetic nervous system. Many people with fatigue issues also face an ongoing battle with motivation, and understandably so. 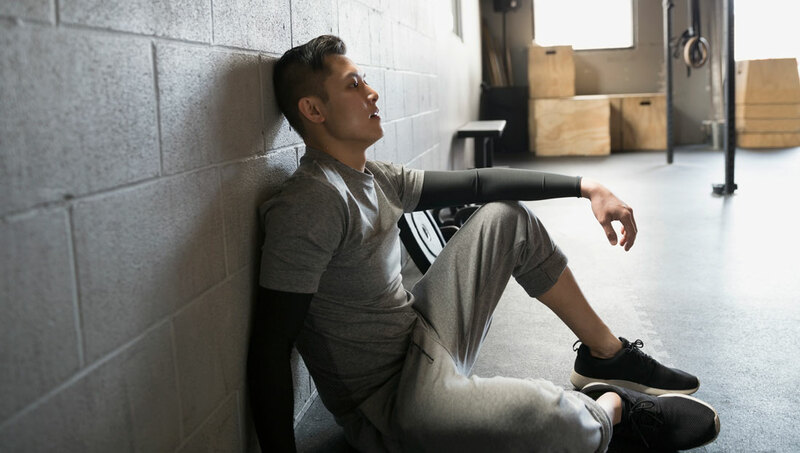 Whether the source is chronic pain, hormonal shifts or illness, fatigue can make it tough to even get through the day, no less find your way to a fitness facility to work out or meet with a health coach. So, how can health coaches and exercise professionals help clients find the motivation to keep at it and empower them to adhere to a program over the long haul? “Some of this comes over time as you get to know your client and trust is built so that they feel comfortable opening up,” explains Myers. It’s also important, she says, to help clients make small changes: “Sometimes we get too caught up in wanting clients to go all out and change everything at once, but this can be too overwhelming for many clients.” In fact, being too aggressive with a program can become a new stressor for a client, serving only to exacerbate the fatigue. This brings up what Graham calls the most important question: How do you know when to push through versus pull back? “That’s really tricky,” she says. “It really depends on the individual.” She suggests looking for patterns, both in a client’s fatigue and in his or her responses to your training or coaching, and then reacting accordingly. Some clients, she says, may consistently need a little push, while others may need you to pull back on the intensity of training, for example. One important point: Health coaches and personal trainers must, in all cases, adhere to the guidelines provided by a client’s physician or healthcare team. An open line of communication is needed to ensure that a client is never being pushed too hard, including daily check-ins with a client if needed to assess how he or she feels. Niki Campbell has been coaching Kelly Ruta since early 2018. Ruta, who is a mindset mentor for female entrepreneurs, was diagnosed in December 2014 with chronic active Epstein-Barr virus, chronic fatigue and fibromyalgia, along with multiple spine disc herniations resulting from an old car accident. The diagnoses came after nearly a year of debilitating fatigue that worsened as time passed. At one point, she was even hospitalized for complete exhaustion. When Campbell first met with Ruta, she started by working closely with her physical therapist to develop a strength-training program. “I developed an exercise plan,” Campbell says, “and then the three of us jumped on a call to go through it.” The physical therapist helped create modifications based on Ruta’s past injuries. This team approach helped ensure that the program would be both safe and effective. Unfortunately, Ruta had a flare-up a few months ago and had to put the resistance-training routine on hold. She currently doesn’t have the physical energy to exercise most days. Plus, she explains, “If I raise my heart rate too much, I experience moderate to severe post-exertion malaise that last up to a week, making it difficult to function.” Brisk walking is typically her only source of physical activity. The things that have helped Ruta maintain her motivation despite these obstacles include focusing on developing a strong mental state, along with meditation, CBD oil, stretching and powerful positive relationships. Thames, T.A. et al. (2012). Fatigue. In: Paulman, P.M. et al. (Eds.). Signs and Symptoms in Family Medicine, Philadelphia, Pa.: Elsevier Mosby. One in ______ American adults say fatigue interferes with their everyday life. 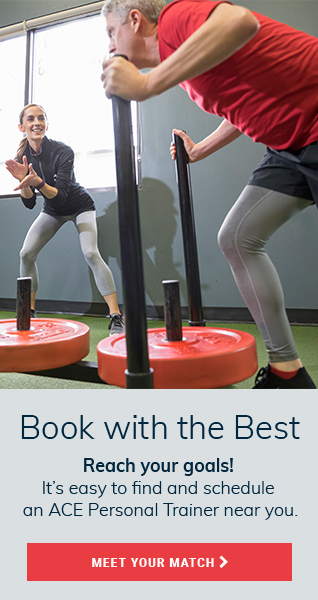 It’s essential that health coaches and exercise professionals create an environment that is free from ________________, and that clients know it’s perfectly okay to share their feelings and that you are able to modify a workout or change the focus of a session based on how they feel in the moment.